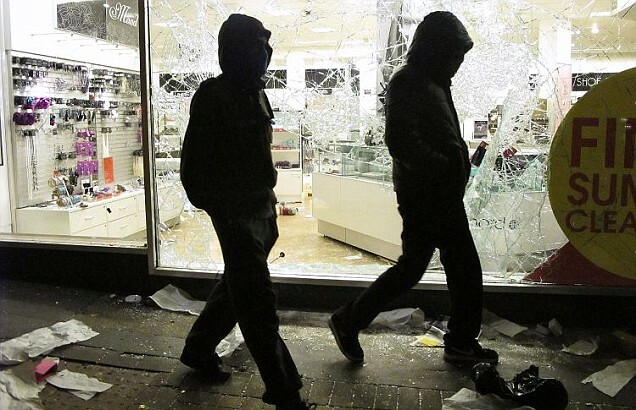 Hooded youths walk past a looted Debenhams store in Clapham Junction during the August 2011 riots. The heat is still continuing to rise in London with riots at raves and estate parties, this time even shots were fired! Cops came under attack from teenagers hurling bottles as they moved in to close down an ‘illegal music party’ in Clapham last night. Hundreds of riot cops surrounded the Clapham Park Estate at 9pm where a summer street party publicised online descended into scenes likened to the “Wild West”. A female cop suffered injuries to her wrist after being struck by a bottle. Two other party-goers were also hurt as clashes broke out around the estate in Plummer Road. Cops today lied about the fact shots had been fired during the two-hour disturbance. Clapham was one of the areas that broke out in rioting during the August 2011 riots, several buildings were torched, many shops relieved of their commodities and attacks occured upon any cops who entered the area. This entry was posted in Rave Resistance and tagged 'Wild West', Clapham, gun shots, London, rave, riot, riot cops. Bookmark the permalink.